Let’s face it, cardio machines can only do so much for your body and your entertainment level. While group fitness first went mainstream in 1982 with Jane Fonda and her high-energy workouts, group workouts have been around for a long time. Did you know that a Navy seal by the name of Randy Hetrick invented the TRX? He did so because he and his Navy friends on board needed a way to work out but there was no room on board for clunky weights. 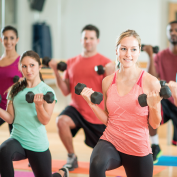 Interested in finding out more about how group fitness classes can help you lose weight? Group fitness is a team-building effort. And while cardio machines do serve a purpose, jumping into a group fitness class can nearly double your benefits and triple your fun! Doing the same thing every day will also produce the same results. If you want more from your day, life, and workout, break out of the mundane and step into one of these out-of-the-box fitness classes! Part of finding a great workout class is finding something that allows you to leave your day at the door. There’s nothing better than doing a fitness class that combines low-impact aerobics and straight-up dance choreography. As if that weren’t enough fun, add some extra energy with some funkadelic lights and pumping music! Whittle your middle and get down with this total body workout! HOT HULA fitness® increases your core strength and definition while also working your glutes and upper body. It was first inspired by the hip-shaking dances of the Pacific Islands including the use of traditional Polynesian drum beats. It blends this native style and sound with modern Reggae funk music turning this experience into a fun, hip workout! All ages and fitness levels are invited! There’s always been a strong connection between the core-specific training of Pilates with the strengthening and stretching of Cal Fit’s yoga. Independently, these classes are important elements to focus on each week. But if you’re short on time, Piloga gives you the best of both worlds! Powerhouse exercises of Pilates with classic yoga poses will turn you into one strong, flexible and zen human being! What is U-Jam you ask? U-Jam is a hip-hop workout that leans more the athletic way. This high-energy interval training cardio class is masked as a heart-pumping dance workout. The entire hour you’ll feel more like you’re in a music video than a gym studio! Workouts should be so much fun that they naturally will keep you wanting to come back for more and more! Our favorite fitness classes are the ones that feel more like an experience than clocking time on a treadmill. All of Cal Fit’s dance classes give us a way to relieve some stress, get in shape, and work on our dance skills! Move over gym blahs, these Cal Fit workouts won’t allow anything but a heart-pumping good time!